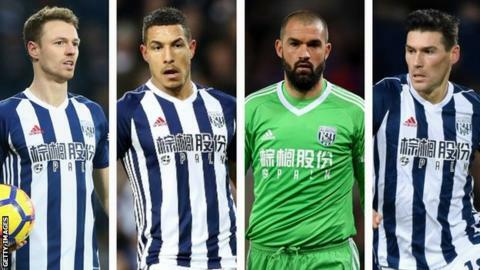 West Brom players Gareth Barry, Jonny Evans, Jake Livermore and Boaz Myhill have apologised - after a taxi was stolen from outside a fast-food restaurant in Barcelona on Thursday. The quartet were interviewed but not arrested by police after the incident, which happened in the early hours of the morning and is being investigated by the Premier League club. "We felt it important we identify ourselves out of respect for team-mates who otherwise could be implicated by association," they said in a statement. West Brom and Northern Ireland defender Evans 30, former England midfielder Barry 36, England international Livermore, 28, and reserve goalkeeper Myhill, 35, said they wanted to apologise for "breaking the curfew" and for "the events which have been the subject of widespread and negative publicity". Mossos d'Esquadra - the Catalan regional police force - had told BBC Sport the four players involved wanted to go out in Barcelona, but found everything closed so took a taxi to a fast-food restaurant. When they left, at approximately 05:30, it is alleged they took the taxi and drove back to their hotel - without the driver. Police were alerted by the hotel and taxi driver, who was reunited with his vehicle at about 08:00. Baggies boss Alan Pardew said the players involved had broken a midnight curfew, adding it was "unacceptable" and he "felt a bit let down". "It wasn't what we wanted," he said. "We've gone there to try to get ourselves ready and up for the run-in and this is obviously not ideal." West Brom, who are bottom of the Premier League, have won just one of their past 25 league matches. They host Southampton in the FA Cup at 15:00 GMT on Saturday. The players added: "We would like to assure our supporters that this incident does not reflect the determination and resolve we possess to do all we can to recover a difficult season." The club said it had "instigated its own investigation into the incident" and said the players "will be subject to the full rigours of our internal disciplinary procedures". It said it would not comment any further on the incident until the investigation is over. These truly are troubling times at West Brom. Bottom of the Premier League and seven points from safety, owner Guochuan Lai took the decision on Tuesday to sack his chairman and chief executive. The men responsible for the football side were untouched by Lai's actions. Yet within hours, four senior players - in West Brom's own words - were completely disregarding a curfew imposed by their manager. If the key "football man" cannot control his most experienced players' behaviour in this situation, it is difficult to envisage any outcome to this season other than West Brom being relegated.